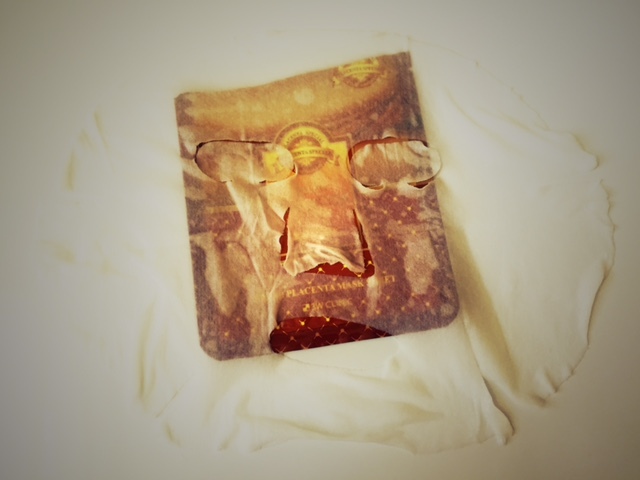 Would you try the PLACENTA mask sheet??? The word placenta is almost as bad as the word moist. I shudder when I hear it. Ick! Although it’s now 2015 using placenta is not a new beauty or health fad. Many beauty benefits are believed to be derived from placenta for skincare, but I have yet to see a set standard that the medical and cosmeceutical communities can agree upon. Most of these help fight aging by reducing the appearance of wrinkles, freckles, and blemishes along with a reduction in sagging skin. I decided to review the 3W Clinic Fresh Placenta Mask Sheet this week because I wanted to see if there would be any noticeable effects. 4. Leave on for 20-30 minutes. 5. 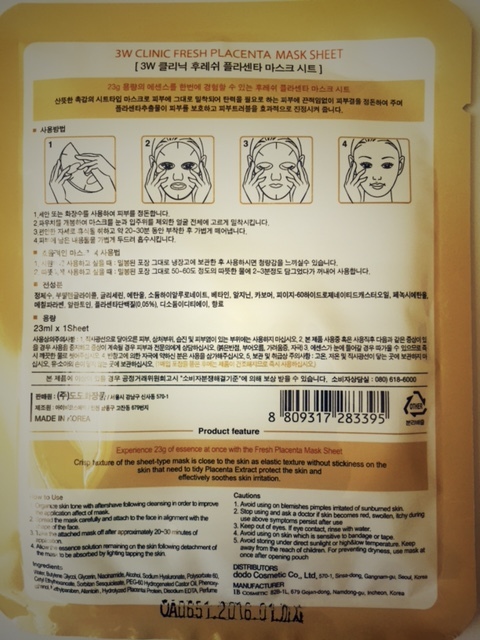 Remove mask sheet and lightly pat remaining essence for better absorption. Roseroseshop has a set of 10 available for $1.84! They currently have 13 different types to chose from. Water, Butylene Glycol, Glycerin, Niacinamide, Alcohol, Sodium Hyaluronate, Polysorbate 60, Cetyl Ethyhexanoate, Sorbitan Sesquioleate, PEG-60 Hydrogenated Castor Oil, Phenoxyethanol, Methylparaben, Allantoin, Hydrolyzed Placenta Protein, Disodium EDTA, Perfume. Yes, it contains Hydrolyzed Placenta Protein, but it is so far down the ingredient list that I doubt there is much at all. What is Hydrolyzed Placenta Protein? Hydrolyzed : Break down (a compound) by chemical reaction with water. Placenta Protein: TLDR version – hormones and other “bad stuff” is removed in order to be used. I have used other 3W Clinic mask so I did not expect any sort of variation. Here’s what the mask looked like once it was opened. I actually thought this mask was going to cover my entire face and neck once I pulled it from the packaging. I was pleasantly surprised to see that once I applied the mask there were no air bubbles so all of my face was covered. The mouth portion was way too big so I had to pull it up, but other than that I had no complaints. Fast forward thirty minutes later and I remove the mask sheet. It was still very wet, but somehow my face felt sticky. I almost decided to wash my face, but instead I relied on the patting method & allowed it to dry some more. In the end it felt like I had a very thin film resting above my skin. I’m sad to say that I was not impressed with this mask. It was just well…meh. I have used the lemon and the snail from the 3W Clinic series and I liked them so much better. I will probably use the ones I have, but I do not think I will repurchase them. I would give this mask a 2.5 our of 5 stars.